No distillery visit is truly complete unless you bring home a distillery exclusive bottling, right? 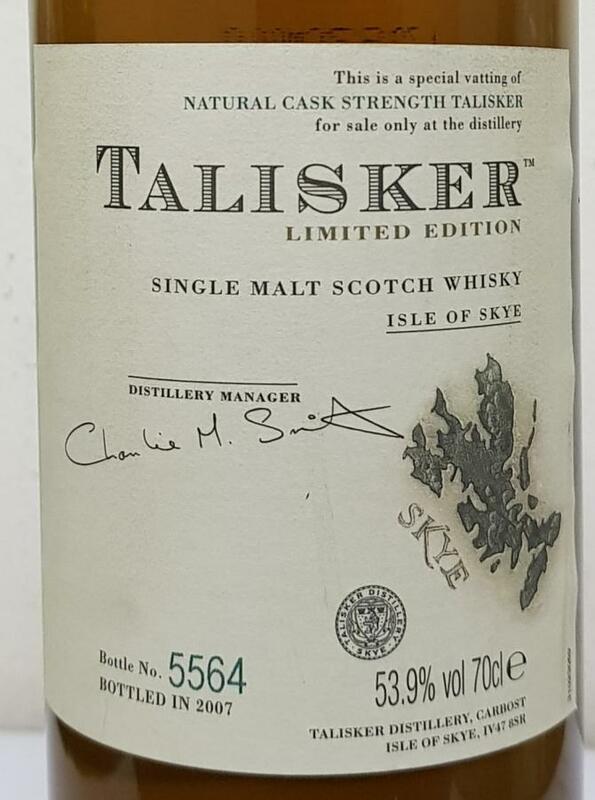 While I have not yet had the pleasure of visiting Talisker myself, I have been able to secure this bottle via a friend. This was the distillery exclusive over ten years ago. Yes, bottled in 2007! I poured it at a tasting and it scored off the charts. The nose is as sharp as a knife and quite salty. Wet rocks in the surf, thunder clouds in the sky, lamp oil, course sea salt, periwinkles, candle wax, thyme, black pepper and shells on the beach. A dry smoke develops, reminding me a bit of exhaust fumes. Boy, oh, boy! To be honest, it is not as complex as the 175th or Friends release – it is even somewhat one-dimensional – but what a powerhouse! The first sip is a slap in the face. Muhammad Ali just nudged me… hard! Big peat, sweet malt, sugared lemon peel that is suddenly outmaneuvered by all kinds of salty notes. Liquorice, pepper and a truckload of salt. Oysters and beeswax… You’d think this doesn’t work, but it works like a charm. Not very complex, true, but so outstandingly satisfying. And than the finish…. So extremely long and every more salty that the taste. A Talisker for Talisker fans. Those who are not yet fans must give this a go and they’ll come around quickly. Unfortunately almost extinct nowadays. From the time that Talisker made genuine blockbusters. This is no exception, big and maritime. A "like it or not" whisky. Well I like it. Relatively one-dimensional on smoke and a bit of peat. The smoke is quite dry and ashy: bbq ash, exhaust smoke, lamp oil. Further: dark rocks (mineral side), marzipan, lemon, seashells, and pepper. Maritime and salty, with a kick of pepper. Seaweed, shells, oysters, peat, lemon juice, and marzipan. Not complex, but very good. Long, very salty, with licorice, seaweed, again oysters, and a truckload of pepper. Big and bold, that is. Talisker NAS 'Special Vatting' (53.9%, OB, Distillery only) This one was for visitors only. Colour: straw. Nose: big, clean, sharp and austere. Lamp oil, wet stones, thyme, seashells and paraffin, sheep, and finally the expected black pepper. Not really multidimensional but exactly what one would expect from a young Talisker, I’d say. Mouth: zing! 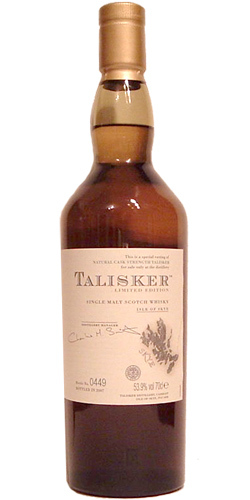 Clean, pure, straightforward Talisker, all on peat, salt, pepper and crystallised lemons. Very, very salty, actually. Finish: long and even saltier. Comments: a simple but totally flawless Talisker, for Talisker lovers. You may pass, should you dislike salt in your whisky. SGP:347 - 87 points. Solid uncomplicated Talisker. A worthy dram. A good malt. Several times I had the impression of having a Lagavulin in a glass. Very unusual for a Talisker. The nose is stinging. Iodine, medicated, woody, musty, smoky, peaty. The taste is not so complex. Peppery, sweet, more smoke, more peat. The finish is medium. Warm, pleasant, smoky, spicy, smoky, peaty. For a Talisker quite unusual malty with light fruit notes (inter alia pear), alternately Gummibaeren and Fluessigkleber with pronounced Addiction factor. Again and again, the familiar, earthy aromas of a good skye-malts. Also surprising is the rather low use of smoke, but this leaves just more room for the unfolding of the otherwise quite harmonious aromas. In the mouth then more smoke. It confirms the fruit component, which comes across quite well with the powerful, but not sharp onset. Harmonized with a little salt and a little fresher than the nose gives the Talisker a lasting impression. As with (almost) every Talisker the hoped-for heat explosion in the throat. If there were doubts in the nose and partly on the palate as well, if this is really a Skye-Malt, I now have certainty :).